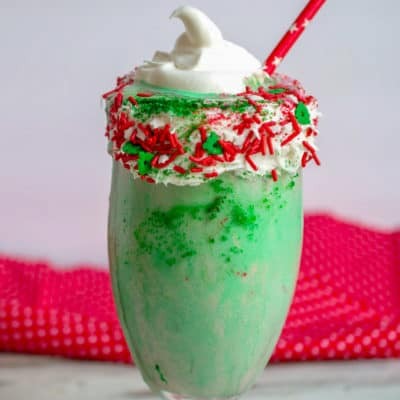 This delightful cheesecake milkshake resembles and elf with green, red, and capped with a whipped topping hat. Go crazy with one big glass, or divided into smaller glasses for the fam! Add ice cream, cream cheese and milk to a blender. Separate mixture into two containers. You may have to put back into freezer to firm back up if it gets too melty. Alternate red and green milkshake into glass(es). Shake and press sprinkles onto sides with the icing, allowing to fall into the shake and brighten it up. Add a dollop of whipped topping, and try to make it stand up, or swirl, like an elf hat.